The International Conference on Ecotourism in Protected Areas in Myanmar opened today afternoon at the Myanmar International Convention Centre (II), Nay Pyi Taw. Delivering his opening address, Vice President U Nyan Tun of the Republic of the Union of Myanmar said tourism is the biggest service sector in the world today. He said more than one billion tourists travel around the world every year creating a million opportunities for tourism-related businesses. In the recent years, tourism has significantly increased foreign currency income and generated employment opportunities in Myanmar. Vice President U Nyan Tun, however, repeatedly cautioned that despite being a key driving force for the economic development of the country, tourism could bring negative impacts, especially on the cultural aspects of the country and its natural environment. Myanmar has huge potential for eco-tourism both for local and international tourists. Moreover, eco-tourism is expected to help fulfill the Myanmar Government’s vision of Green Economic Development. The three-day Conference will focus on ecotourism as a mechanism to strengthen livelihoods, adaptation, and conservation. The Conference is expected to engage participants in conversations about ecotourism and related issues, including climate change, spiritual tourism, using ecotourism to finance nature conservation, and working with host communities. 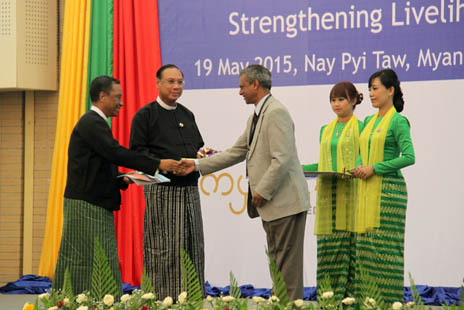 Myanmar’s new Ecotourism Policy and Management Strategy, developed with technical collaboration from ICIMOD and supported by the European Union and the GMS-Environment Operations Centre, was also launched at the opening ceremony. The Policy defines ecotourism in Myanmar while outlining the special relationship between tourism and protected areas in the country. It provides a distinctive ‘Ecotourism Partnerships Framework’ to ensure that ecotourism activities finance protected area management. 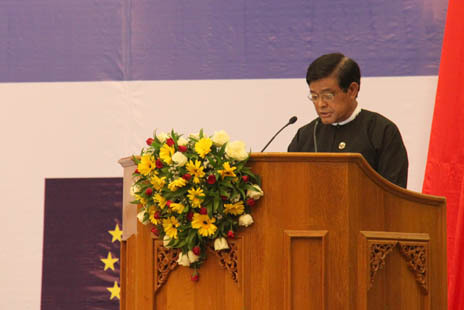 At the Ecotourism Policy Dialogue held in the morning of 19 May before the formal opening of the Conference, Union Minister of Environmental Conservation and Forestry U Win Tun and Union Minister of Hotels and Tourism U Htay Aung delivered the opening remarks. It was followed by an opening remark from ICIMOD’s Regional Programme Manager Dhrupad Choudhury. During the session, senior officials from the Myanmar Government ministries, invited guests, ecotourism experts, and participants from international organizations discussed ecotourism policy in detail. More than 200 participants attended the opening ceremony of the Conference.